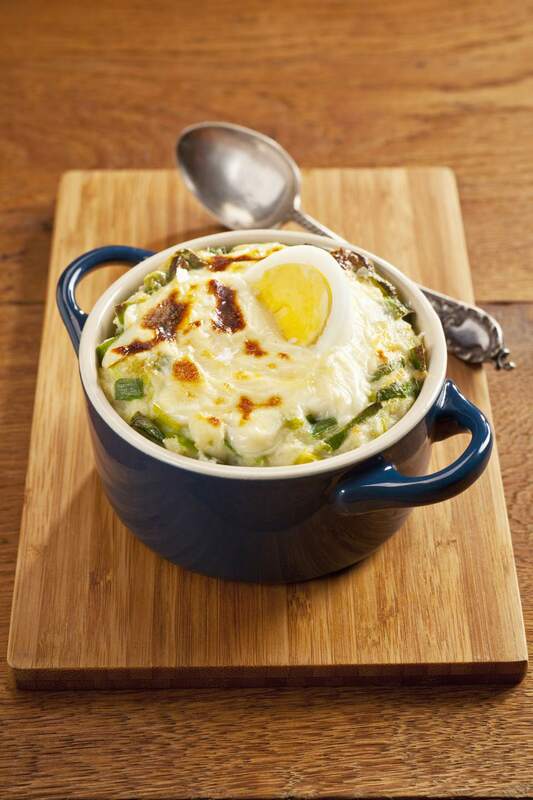 Anglesey eggs might not look the prettiest dish on the block but believe me, it has one of the best flavors with its bed of soft mashed potatoes with hard boiled eggs all smothered in a thick creamy leek and cheese sauce. This delicious Welsh recipe is perfect for vegetarians as a dish on its own, or the Anglesey eggs can be teamed up with meats and a particularly good match is with grilled bacon chops. Anglesey eggs come from Anglesey, a large island reaching out into the Irish sea separated from North Wales by the Menai Strait. Melt 1 oz/25g butter in a large, roomy frying pan. Add the finely sliced leeks, season generously with salt and a little pepper. Cook for 5 mins on a medium heat until the leeks are just beginning to soften, take care to not burn. Raise the heat slightly, stir in the flour, cook for 2 minutes stirring continuously. Still stirring, slowly add the milk, continue to cook for about 2 minutes to make a thick, creamy sauce. Simmer on a low heat for 5 minutes then add half the cheese, stir then check the seasoning. Generously butter an oven-proof dish, deep enough to take all the ingredients, but not too wide, you want thick layers of potatoes and sauce. Firstly add the mashed potatoes, spread to cover the base of the dish in a thick layer. Neatly arrange the egg quarters gently pushing each into the soft mashed potatoes. Pour the leek sauce over. Mix the remaining cheese with the breadcrumbs and sprinkle over the sauce. Bake in the preheated oven for 20 mins or until bubbling and a golden brown crust on top. Serve as a dish on its own or as a side dish for meats, particularly delicious with bacon chops. The Perfect, Winter Dish Has To Be a Hearty, Filling Lamb Cobbler. Eggs Florentine Made Easy. Done.